I'm having difficulty locating a button to change capital letters to small letters & vice versa. Please help. You can use the button on the bottom with the arrow pointing upwards left to change to switch whether you type with Capital or small letters is circled in the photo above in YELLOW. The other button circled in orange switches between numbers and letters. The default setting on the LG 500g when you start is "Abc" which means that the first letter you type in a sentence will be upper case. This setting is indicated in the top right part of the screen as show in the second photo. 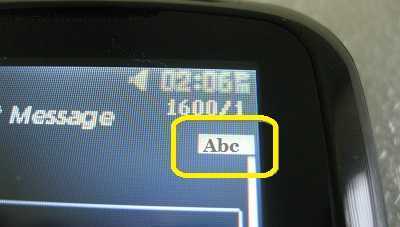 After you type the first letter, the case setting switches to "abc" mode so that all subsequent letters are lower case until the end of the sentence. After you type a period and a space, the case switches back to "Abc" and the next letter is capitalized. If you want to use a capital letter in the middle of a sentence, simply press the "arrow" button and the case setting will switch to "Abc" and you next letter will be capitalized. If you want to type a series of upper case letters, then just hit the arrow button again to put the case setting to "ABC" so that all subsequent letters are capitalize until you press the arrow key again. It's interactive & will walk you through a lot of features. I lock the keypad [easy to unlock] & have never hit the browser button accidentally. Texting is so easy now as well. Have had the phone for 2 weeks; hope it lasts! Thanks for your info. I haven't tried it yet & will do so soon. It's a lot better than where I was @ in the beginning. I also was disappointed in the owners manual, that came with the LG phone, as this phone, of course, has many, many more features than my previous cell phone which was a plain vanilla cell phone (Nokia 1100) used only for voice & text communication. However SB, I did not use the texting feature of the Nokia since I'm a senior with no understanding of how to text. I feel you know what I mean. It will take, I feel, a while with locating information to be able to use & understand the procedures & the capbilties what my new LG LG500G can & will do. The owners manual provides liitle to no info what this phone can & will do. This is where I'm disappointed in LG in not providing info of its use. Until I located your website on Google, I had no knowledge where to look to get the info to operate & undersatnd all of the features of what this (LG) phone can & will do. I wished someone, especially LG, would come of with a tutoring disk or on paper, to help me understand what this phone can do. Again thanks for being there for me SB. Of course, with what I just said above of learning the procedures & what the phone will do, I will most likely call upon you many, many times again, in understanding how to use it. Return to Tracfone LG 500g.